Find answers to the most frequently asked questions about the Teach Them Diligently Homeschool Convention on the page below. You can also search by typing your question in the search field at the top-right of our website and clicking on the answer. Below, you can click any question to view the answer. Are there individual, single-day, or Exhibit Hall-only passes available? Yes, we do sell registrations for one person for the entire convention or single day passes for the family. We do not sell Exhibit Hall only passes. Can I share a family registration with a friend? No, family registration can not be shared with a friend or family member from another household (Grandparents are the exception). Each friend or family member from another household most have their own registration. What time is the Exhibit Hall open? What are the hours & schedule of the convention? While we try to keep the schedules for each event pretty much the same, each site will have slight variations. As we get closer to the events, detailed schedules will be published for each location. Below is the general overview of the daily schedule. Children's Program and Teen Program have their own schedules and FAQ. Please visit those pages for more information. Sign up here for the newsletter to keep up to date with details of what is happening at the location(s) you will be attending. Can I get recordings of all the speaking sessions? Yes. We will have recordings for almost every speaking session available at the conventions. Recordings from the 2013 - 2018 Conventions may be purchased here. How do I modify my registration after it has been processed? You can modify your registration by visiting this page and logging into your account. You are able to change your email address, names and other information. You can also add options such as Men’s Breakfast, Children’s Program, Teen Program, and Robotics. However, we do not offer refunds once your registration has been processed. Are grandparents included in the Family Registration? Yes, they are! You can request additional credentials for them on site. You do not need to add their details to your registration. What is the one main goal and purpose of Teach Them Diligently Convention? Teach Them Diligently hopes to encourage families and parents in the discipleship of their children. Homeschool is not the Gospel, and just because parents homeschool their children does not mean their children will honor God with their talents when they leave the home. We homeschool to disciple our children and to equip them to glorify God when they leave the home. Christian parents do understand this, but they need constant encouragement, because discipleship is hard work. 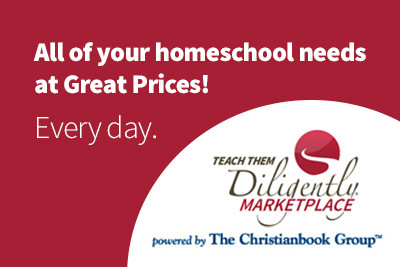 Teach Them Diligently is a tool to refresh the vision of parents and to encourage them to disciple—to not lose focus of the Center of our homeschool, which is Jesus Christ. The entire event is soaked in prayer, and the Gospel is prevalent throughout the event. This is what sets us apart and why the fans that know us are so enthusiastic. We encourage you to read the testimonials. Teach Them Diligently is distinctive, and you can see this through the families that have experienced our events. Will there be curriculum providers or speakers that do not believe young earth creationism at Teach Them Diligently? We require all curriculum companies and speakers who provide a Bible, History, or Science Curriculum that touches on Beginnings or the Trustworthiness of the Bible to sign a statement of faith; however, if a curriculum provider or speaker is outside those three areas, we do not insist on a signature. As a result, it is possible that companies focused on grammar, handwriting, math, etc., do not all necessarily believe in young earth creationism and may even be non-Christian. We also ask curriculum re-sellers to not bring books supporting evolution as fact. Why does Teach Them Diligently focus so heavily on Young Earth Creationism and the inerrancy of the Bible? We connect these two views directly to the Gospel. The Gospel literally means news. It is news of the most amazing redemption story ever told. It is news of the Grace and Mercy of Jesus Christ. Jesus Christ is the One foretold to sit on the throne of David and preside over an ever increasing kingdom (Is. 9:7) Jesus Christ commands before His ascension into heaven, “All power is given unto me in heaven and in earth. Go ye therefore, and teach all nations, baptizing them in the name of the Father, and of the Son, and of the Holy Ghost; Teaching them to observe all things whatsoever I have commanded you:” (Mt 28:18-20). To summarize, because Christ has authority, He is commanding us to make disciples and to disciple. To do what He did during His earthly ministry. Where does His authority come from? Well, the Father gave it to Him, and beyond that, He created us, and His Word is true and unwavering. In Romans 5, Paul directly connects the Gospel or News of Jesus Christ to Genesis by saying that through one man sin came into the human race and through one man we are redeemed. This directly connects the creation of man to the Gospel of Jesus Christ. To undermine, the first three chapters of Genesis is to undermine the Gospel. Don’t get me wrong: God does not need us to tell Him Who He is. And, the story is true whether we believe it or not, “…For I say unto you, That God is able of these stones to raise up children unto Abraham” (Lk. 3:8). However, we believe that to undermine the creation account found in Genesis is to attack the Gospel. Any description by man of how the world came to be must be based on the account found in Genesis-include a first Adam and second Adam-or they are undermining the Good News of Jesus Christ. If you do not believe in a Young Earth as fact, you are still welcomed to come; however, we do ask you to respect our views on this issue. As you can see, we believe it is quite important! What is the overall purpose of Worldwide Tentmakers? Worldwide Tentmakers exists to promote, prepare, and place self-supporting witnesses worldwide. We believe that business has great potential as a conduit to spread the Good News of Jesus Christ. We use Paul as an example, just as most mission agencies do. Paul was a tentmaker in Corinth, Ephesus, Thessalonica, and other places while planting churches in those cities. So, in a sense, one of the purposes of Teach Them Diligently is to introduce the ministries of Worldwide Tentmakers to homeschool families. Is Teach Them Diligently organized by a for-profit or non-profit organization? Teach Them Diligently was originally organized by a non-profit mission-board called Worldwide Tentmakers. More recently, Teach Them Diligently has been split out from under the mission board to a separate for-profit company that shares leadership. For instance, both Teach Them Diligently and Worldwide Tentmakers have the same President. However, Teach Them Diligently funds flow directly to ministries that we support overseas. A portion of every dollar spent with Teach Them Diligently is transferred directly to Worldwide Tentmakers to support its ministries. We no longer funnel money through expenses of the conferences. Instead, we pull money directly off the top and send it overseas. Currently, Worldwide Tentmakers supports ministries in the Far East, Poland, and Scotland. We are in countries considered open to the Gospel as well as Restricted Access Countries. Primarily, our ministries are involved in education in some level overseas because of the opportunity it provides to present the Gospel of Jesus Christ. Because we are a mission board, the Gospel is central to everything that we do. Are children and nursing babies allowed in the speaking sessions? You are welcome to bring your children into the speaking sessions; however, we do ask that you be considerate of others by having your children sit on the floor when possible, so adults can take the seats. Our goal is to be as family-friendly as possible, and we do not want parents to miss any sessions. For tips on how to keep littles occupied during sessions, check out this blog post. Just as is customary with any ticketed event, we are not able to offer refunds or cancellations once a registration has been processed. Though we regret that this is the case, we are not able to accommodate massive changes or transfers of registrations. All registrations are considered final. If you register for one location but have a conflict, we do usually accept transferring your registration to another Teach Them Diligently event. However, this is a process that must be approved and manually handled by one of our staff in the back end of the website system. Do you offer any volunteer subsidies (scholarships) for the Convention? Yes. We have a limited number of volunteer subsidies available. These subsidies involve working several hours at the Teach Them Diligently Convention. You can follow the volunteer tab on the main menu for more information about volunteering at one of our sites. Volunteers will receive a free registration if they are willing to work 8 hours at the convention. Volunteer Now! Can I buy tickets for individual days or for just the exhibit hall? We offer a reasonable price for the entire Convention. Our family price is extremely competitive with most conventions’ single day or Exhibit Hall only passes. We do have an individual pass for one person to attend the entire convention or a single day pass for your family to come just one day. We do not offer an Exhibit Hall only pass. What about on-site parking and lodging? We have negotiated lower parking rates for guests staying on-site. If you are looking to stay off-site, please remember to take into account the price of parking and driving times. What is included in the family registration? The family registration at each site includes all of the keynote and featured speaking sessions (nearly 200), the exhibit hall for all three days, plus a special tote bag. Children’s Program, Robotics Program, Teen Program and Men’s Breakfasts are offered at an additional charge. Any sessions not included in the family registration fee will be marked in the descriptions. Are there programs and options for children? Absolutely! We have optional programs for children and young adults. The children’s program runs Friday and Saturday from 9:00 to 6:00 (with a break for lunch with parents). It is geared to ages 4 to 12. This is a wide age range, and young people will be split into age-appropriate groups for more specific instruction. The program this year focuses on love for God and love for others. Mixing a lot of fun with great lessons, this will be a weekend your young people will never forget! The Four-12 Teen Program will once again be offered. It is aimed at 12 to 18 year olds. Teens, aged 13-18 are also needed to participate in our servant leadership program by volunteering to serve in the children’s program.